PlayFrank Casino is a relatively new addition to the online world as it came into being in 2014. Since then, it has made leaps and bounds in the industry providing players with an easy, colourful, and highly accessible way into the gaming world. The interface is charming from the get-go. It is full of primary colours, simple stylised designs all on a relaxing baby blue background. The setup is also straightforward with players easily navigating the site through the menu bar. To make things even better, the site is available via desktop and mobile devices always using an instant-play setup. The casino also uses the software from a large number of developers, thus giving them a huge range of game choice and an edge over their competitors. Most players around the world can access the site as well, however notably, players from the United States and a few other countries are prohibited, so it's important to check if you're eligible. The casino has a strong policy which puts the player first. This is most evident in its strong security measures - the site is SSL encryption protected, ensuring that private data from clients do not end up in the wrong hands. Additionally, the site is fully licensed with the UK Gambling Commission and the Malta Gaming Authority, both of whom ensure that the casino meets specific requirements. Regular audits and links to responsible gaming groups round out this stellar site. PlayFrank casino offers a number of bonuses to its players. This is common practice in the online casino world as it is important for casinos to be able to stand out from each other, enticing in new players to their site. 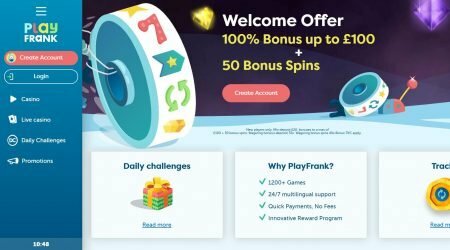 PlayFrank goes a step further and offers many additional bonuses once you’re signed up. 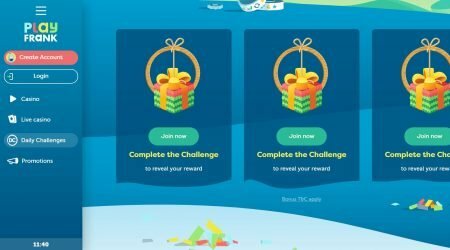 The first bonus received is the welcome bonus, and this comes in the form of a match deposit bonus once the player has signed up. This is 100% match up to a value of £100. To be eligible, players must make an initial deposit of £20. This is credited instantly to the account along with the 50 bonus spins for the game Starburst that will also be awarded during this welcome bonus. Players should note that the bonus spins are only valid for 24 hours after receiving them. There are different wagering requirements in place on the two parts of the welcome bonus. The bonus cash is subject to a 35x wagering requirement while the spins have a 40x wagering requirement. If any winnings acquired by either part of the bonus are to be withdrawn, these requirements must first be met. If the requirements are not met, then the money cannot be withdrawn or moved to the real money account and the player will lose this from their account in its entirety. As we outlined, the welcome bonus comes with a series of bonus spins, but this isn’t the only extra rewards available. For those players already playing, there are daily challenges put in place. These will appear to each player in the dashboard of their account and usually involve triggering a specific amount of bonus rounds, a specified number of big wins or wagering a specific value. There’s also a rewards programme in place that allows players to level up when they meet certain in-game requirements. At each level, players will receive new rewards, which can be anything from bonus spins to extra cash. Essentially, it is anything that helps the player play that little bit longer while providing a lot of fun. 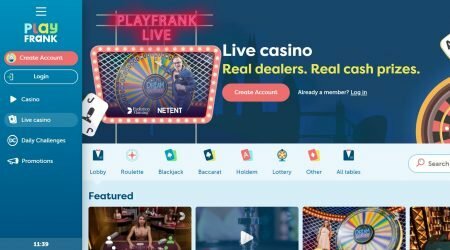 PlayFrank has over a thousand slots at its disposal. This is due to the fact that it uses a huge number of software providers to power its site. Providers include NetEnt, IGT, Quickspin, Nyx, Yggdrasil and Evolution Gaming are present, among others. Slots are listed in easy categories and include a number of top favourites such as Gonzo’s Quest, Immortal Romance, and Cleopatra. Progressive jackpots are equally well-represented with Mega Fortune, Mega Millions, Lots A Loot, and Hall of Gods all offering staggering jackpot amounts just waiting to be grabbed. There are a lot of virtual table game options available for players at PlayFrank. This includes a number of different blackjack, roulette, and baccarat versions. Players can even get to grips with a version of Three Card Poker or Oasis Poker. There is an excellent range of video poker options for players, including an impressive eight different versions of Jacks or Better, which certainly puts this ahead of most of the casinos. Similarly, there are six different Deuces Wild games available, as well as other poker options. The live casino is equally well-stocked, containing roughly fifty different games. Blackjack is the most well represented with over thirty different variants, all different depending on their table limit, style of play and varying rules. Roulette is also available in many different options including Auto, Lightning, Immersive and European. Finally, the collection is completed with a number of different baccarat tables with a table limit of just £1 through to £2000. No matter your preference, you’re sure to find something to suit here. PlayFrank casino has highly secure payment options available. These include Visa, Mastercard, Skrill, Paysafecard, Neteller, and Trustly. No matter which deposit method is used, the money will be credited instantly to the player’s account. There is a minimum of £20 required (or the equivalent in your own currency), whereas the maximum deposit amount will depend on the payment option that is used. Withdrawals take slightly longer. It should also be noted that withdrawals will automatically be made via the method used to make the deposit. Withdrawals usually take a day to process following the verification processes used by PlayFrank casino. Once these are cleared, withdrawals will appear anywhere from one to five days, depending on the method used. Limitations on withdrawals include a minimum £20 and a maximum of £10,000 a week. Customer support at PlayFrank is second to none. There is a live chat function available, and this can pop up on any page of the site. Simply filling out your name and entering your query will garner a response within minutes. This system is open 24/7 so no matter when the issue arises, someone is online to professionally, and courteously, help you out. For all players, there is a very useful FAQ available on the website which covers most of the main questions. It is worth having a look here first before trying to contact staff. Like the website itself, customer support is available in a number of different languages including English, Finnish, Norwegian and Swedish pushing the customer service to a whole new level of excellence. PlayFrank has a lot going for it. It’s clean, bright, and cheerful, which helps create a friendly atmosphere in which to play. There are a whole host of bonuses and the rewards system, and daily challenges just serve to add an extra exciting element to the proceedings. The selection of games is outstanding – a thousand plus games is something not to be sniffed at and ensures that virtually everyone is happy with what they can get. Security, customer service and payment options are all of high quality, ensuring that players are well taken care of. TST and iTech Labs both do regular auditing on the games to ensure that all aspects of the site are fair. The fact that PlayFrank puts the player first in everything they do, makes this casino that bit better than most. But don’t take our word for it! Have a look for yourself, test out the games and get playing!